Insta-Clamps™ are a great item to have to stop leaks in copper tube and sweat fittings with a professional repair clamp available in various sizes. We also carry an Insta-Clamp™ Plumbers Kit for those of you who would like to have a variety of Insta-Clamp™ sizes on hand. Insta-Clamps™ can repair M, L, and K copper tubing solder joint pipe leaks on tees, 90s, 45s, reducers, valve ends, threaded adapters and on straight pipe. Insta-Clamp™ is the only copper repair clamp on the market that will stop all leaks with a 360 degree seal on both fitting and tube side on copper solder joints. Insta-Clamp™ is made specifically to fit the copper tube O.D. on one end and the solder joint fitting O.D. on the other end. The unique stepped rubber design creates a full 360 degree seal around both surfaces. 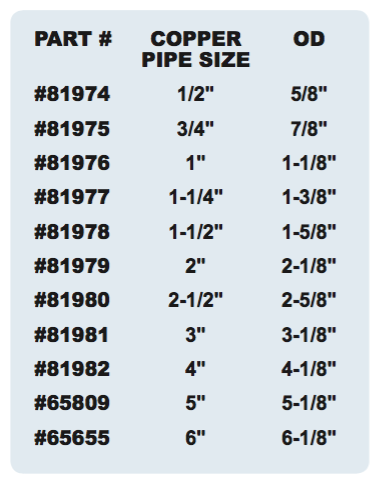 Insta-Clamp™ is designed to be only 3″ wide with the step offset in the rubber seal, the 60 percent seals on the copper tube and the other 40 percent on the solder joint connection. The 60/40 ratio in the rubber width allows the repair clamp to fit into tight areas. Nothing compares to the Insta-Clamp™ for 100% positive stop of leaks in copper tube and sweat fittings. We have Insta-Clamp™ Repair Clamps available for the following copper pipe sizes: 1/2″, 3/4″, 1″, 1-1/4″, 1-1/2″, 2″, 2-1/2″, 3″, 4″, and 5″. Bolt and Nut are zinc-chromate finished carriage bolt, nut and washer. Interested in buying a bunch of the Insta-Clamps? 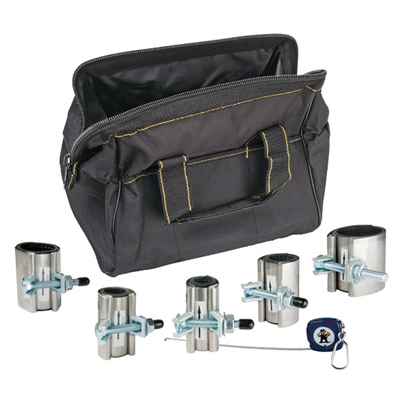 Then you may be interested in the Insta-Clamp™ Plumbers Kit, which comes in its own tool bag! It includes one size of each Insta-Clamp™ from 1/2″ to 2″, a 24″ OD Tape Measure, and in a 12″ canvas tool bag. To order either individual Insta-Clamp™ repair clamps, or the Insta-Clamp™ Plumber’s Kit, simply give us a call to Monday through Friday, 8AM-5PM EST on our toll free number: 800-442-6622 or submit a quote on our website.